This is not the first time I have said this, but it bears repeating again because it is so true. The absolute most important thing you can do to make yourself a better cook, barbecuer or griller immediately, is to get a good digital thermometer for your food and another for your grill or oven. The all-new IBT-4XS INKBIRD Bluetooth thermometer may be the answer. 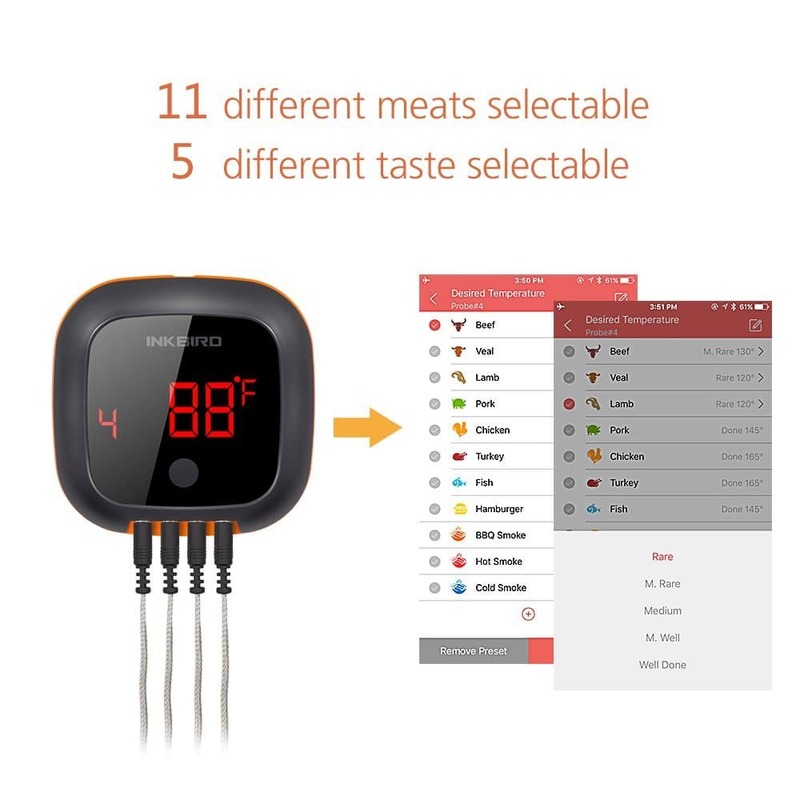 I have covered the benefits of using a digital thermometer many times in several articles in the past including this one; “The Advantages Of Using A Digital BBQ Meat Probe – Why You Shouldn’t Be Grilling Without One” and this one; “6 Reasons Why You Need a Remote Digital Food Thermometer” just to name two. I 100% believe in the benefits of a good digital thermometer to take your grilling skills to the next level. Enter the all-new IBT-4XS INKBIRD Bluetooth Thermometer. This remote digital thermometer is a great example of such a device and has got you covered for your grill and oven. Until recently, I had never heard of the INKBIRD Bluetooth Thermometer. Fortunately, I was contacted by an INKBIRD company representative and asked if I would like to give it a test run. I say fortunately because, for a product that was not even on my radar, it turned out to be a surprisingly well-designed, well-built and smart remote digital thermometer that I can now share with you. Bluetooth Smart connection for use with free BBQ GO App. The INKBIRD company was established in 2010 and specializes in creating and selling home automation products like BBQ thermometers, temperature controllers, and humidity controllers to name a few. Their claim is that that they pride themselves on providing a professional product at competitive pricing. This is INKBIRDS 4th entry into the wireless thermometer category with each new model adding small improvements and or updates over the previous ones. After researching them all, this is possibly their best entry yet. The remote thermometer arrived in a heavy duty box and was very well packaged. Each of the four temperature probes was individually coiled and wrapped. Each probe tip had a protective rubber sleeve included, which was a nice touch. The body of the device itself was very streamlined and looked very sharp. The only button I could see was the on/off button on the bottom of the device. It had a large display screen and looked simple yet stylish. It was surprisingly lightweight and sleek but somehow still felt sturdy/durable. It didn’t have the look or feel of a cheaply made product in any way shape or form. The included user’s manual was easy to follow (maybe too easy, more on that later) and the probes were extra-long with solid craftsmanship. It was off to a good start. INKBIRD is a company to keep an eye on when it comes to remote cooking thermometers. 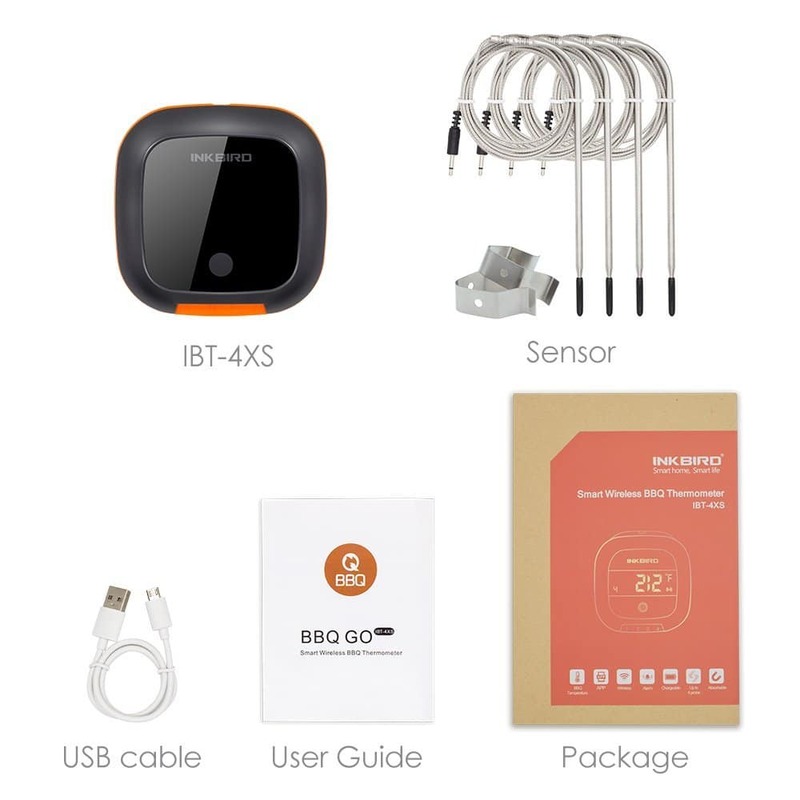 With their all-new IBT–4XS BBQ Bluetooth thermometer, you get a high-end device with a large range of useful features at a reasonable price. Problems with remote digital thermometers on the market have brought INKBIRD to innovate a new and improved device. One specifically designed to address the issues of past products. 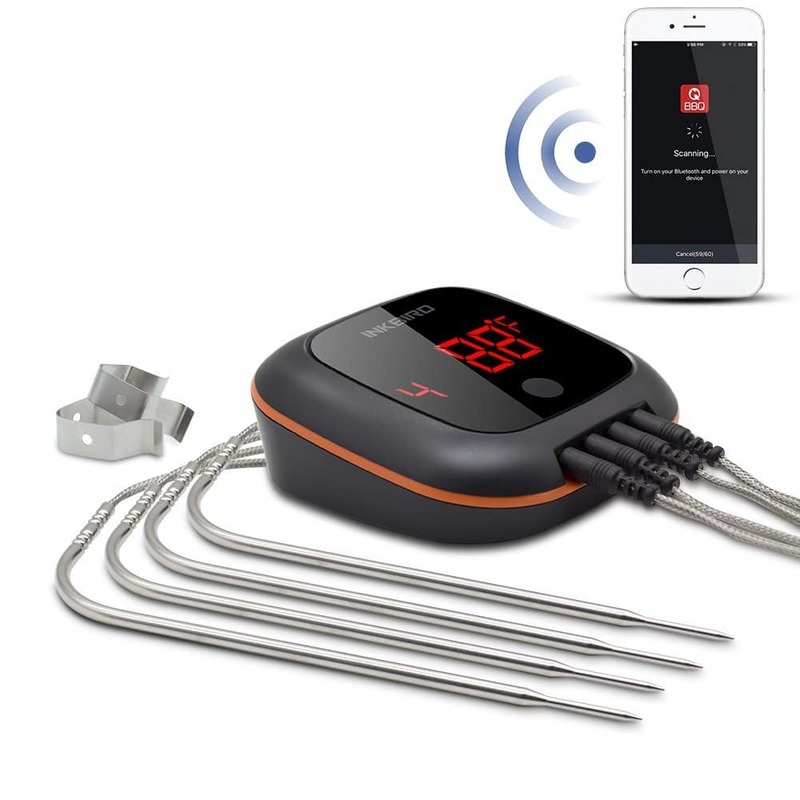 With the IBT–4XS, you get a multi-functioning food and grill thermometer with a nice Bluetooth range. With the ability to be connected up to 150 feet away from the device, the IBT–4XS gives you the distance you need to work on side dishes while your food cooks. Being able to keep your hands free, you don’t have to think about moving the receiver along with you as you go, just keep cooking and working as normal because the receiver is your smartphone. With preset and custom alarm settings, you can get alerts for both your food and grill temperature, letting you know exactly what is going on under the hood without having to open the lid. The setup and pairing of this device were really one of the simplest I have ever experienced. After downloading the free BBQ GO App to your smart device, you are ready to power on the thermometer. It works like this; Plug the probes into one of the four probe ports, power on the device with the switch on the back, and open up the app. The App recognized the thermometer right away and paired immediately with the tap of the button, and it stays paired too. There is no need to do this every time. Now toss your favorite piece of protein on the grill, slide your probe tip into the thickest part, choose your food type and the exact temperature doneness in the app and BBQ GO will do the rest. The app will alert you when your food is done. A second probe can be clipped to the grill (two probe clips included) to monitor the heat at the exact location where the food is cooking. There are also options in the app to create custom temperature settings and ranges for both the food and your grill. The INKBIRD IBT–4XS grilling thermometer is very intuitive. Of course, I always suggest you read the user’s manual, but the IBT-4XS and the BBQ Go App are super user-friendly and helps make grilling easier, even for beginners. The IBT–4XS is INKBIRDS latest remote thermometer release and comes with a sleek new and lightweight design that has been streamlined to be user-friendly. Featuring four resilient stainless steel probes, which are included, four probe ports, a timer, and grill and food alarms that let you know when your food is ready! The device features a non-removable lithium battery that is USB rechargeable. You can easily switch between displaying the temperature in Fahrenheit or Celsius in the App depending on your preference. The IBT–4XS offers a nice temperature range of 32℉~572℉ (0℃~300℃) to monitor the heat of your food and grill. This is perfect for indoor or outdoor cooking, grilling, baking, and brewing. The accuracy of any thermometer is a big consideration since that is the main reason for having a thermometer in the first place. The INKBIRD IBT–4XS comes within ±2℉/±1℃ of exactly accurate, which is very good for a high-end digital probe thermometer. The accuracy tested very well in comparison to my Thermoworks MK4 instant read thermometer, and that is saying something. A large, bright LCD display measuring 2.2” x 1 in diameter makes it easy to read the temperature from just about every angle. Another positive is that it does not wash out or fade in bright sunlight like many other thermometer displays that I have tested. The IBT-4XS comes with a very useful rotatable display feature. Just double tap the bottom of the display and the readout will flip over allowing you to see your readouts from either angle. I can speak from experience and say this is a great feature to have. One of the main features is the ability to connect through Bluetooth wirelessly to a smart device like your phone. With a range of up to 150 feet/50M, you are definitely not chained to your grill when you use the IBT-4XS. Your phone will send an alert if you go out of range and lose connection. It’s a super simple task to pair or un-pair this thermometer. The BBQ-GO app is fully customizable and easy to use. Download the APP and you can intuitively figure it out right away! The app lets you choose from a large list of preset meat options (poultry, beef, pork, fish, and lamb) with a selection of doneness choices for each. You can also create custom settings for each of the four available probes independently. The great part is your custom settings are all saved when powered off for future cooks. The displayed temperatures are all updated real-time on your smartphone. The app also has graphing capabilities that track your cook as it goes. The APP will also send you alerts by sound and vibration if your preset temperatures go outside the set ranges for both the food and the grill. The APP also includes a timer that features an alarm as well. The IBT-4XS comes with four extra-long (4.9ft/150cm) stainless steel food probes. The extra length of the probe wires has really come in handy for me several times already. 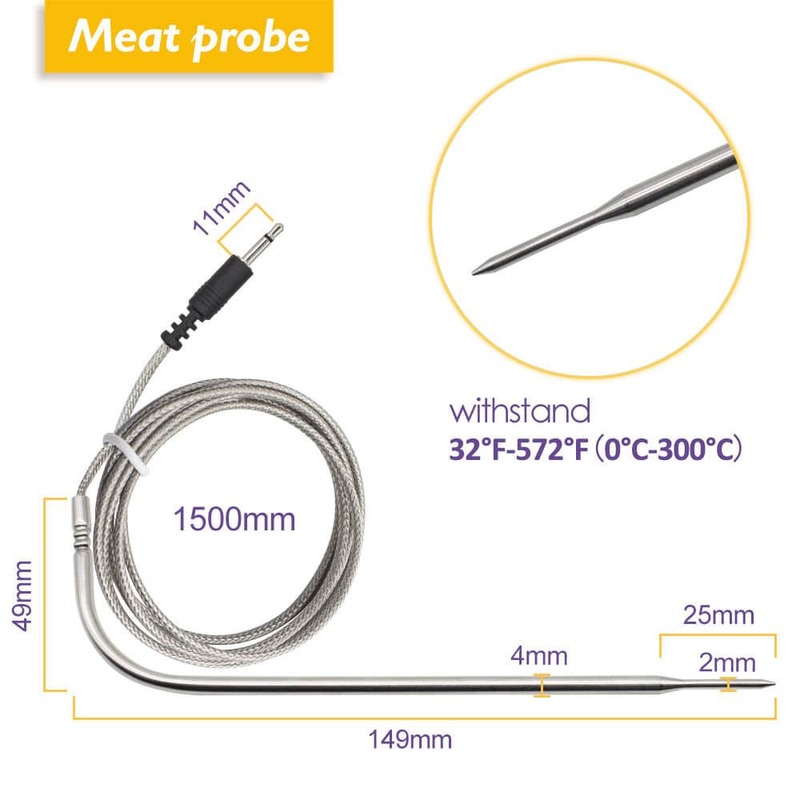 Two probe clips are included for attaching your probe to the grates of the grill so you are easily able to monitor the temperature of the exact spot where your meat is cooking. An interesting new feature added to this device is a built-in 1000mAh rechargeable lithium battery. 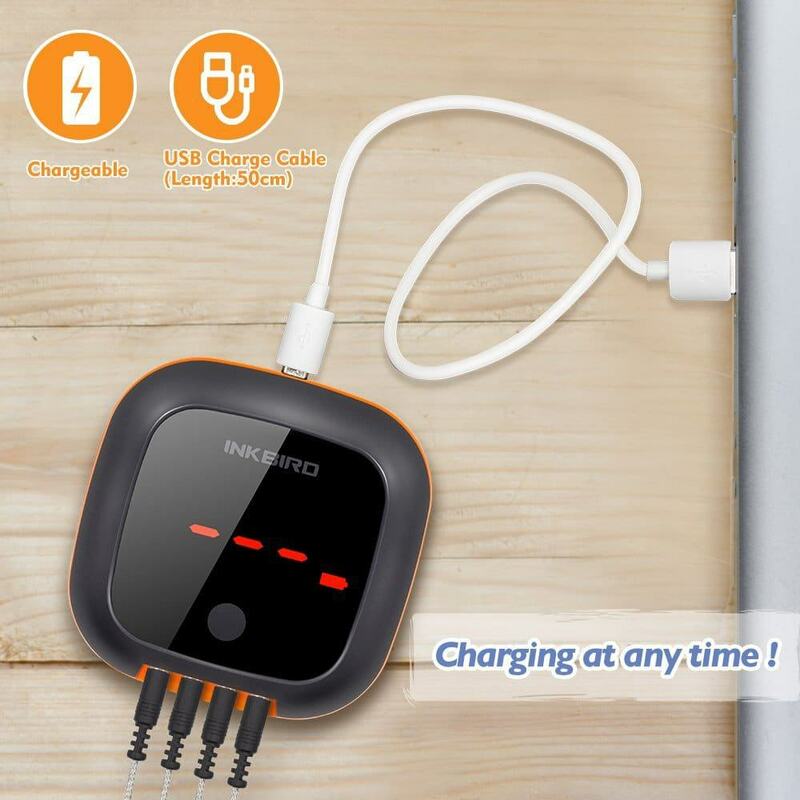 The battery is non-removable and is charged by using the included 50cm/1.64ft USB charging cable. This means no more buying replacement batteries, which saves you money in the long run. When fully charged, the internal battery should last for 60 hours of use. Think about that for a minute. That is sixty, one-hour cooks before you will need to recharge your thermometers battery. The current state of the battery capacity is displayed in the BBQ-GO APP so you always know where you stand on battery life. 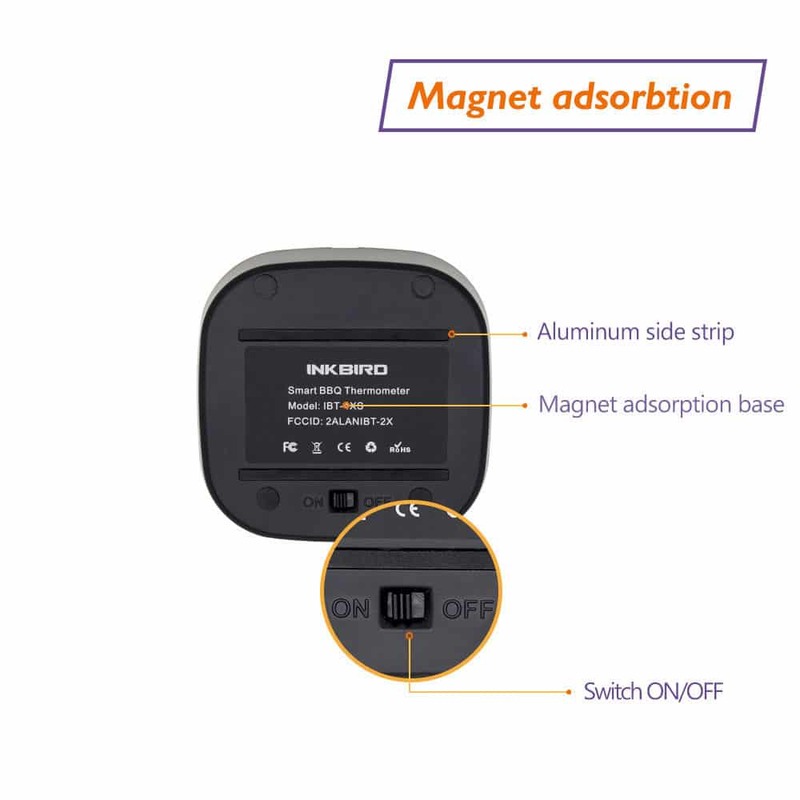 The IBT-4XS comes with very strong magnets built into the bottom of the device letting you attach it to your grill or oven for easy viewing. I was very pleased with the strength of the magnets when mounting it to my grill shelf. 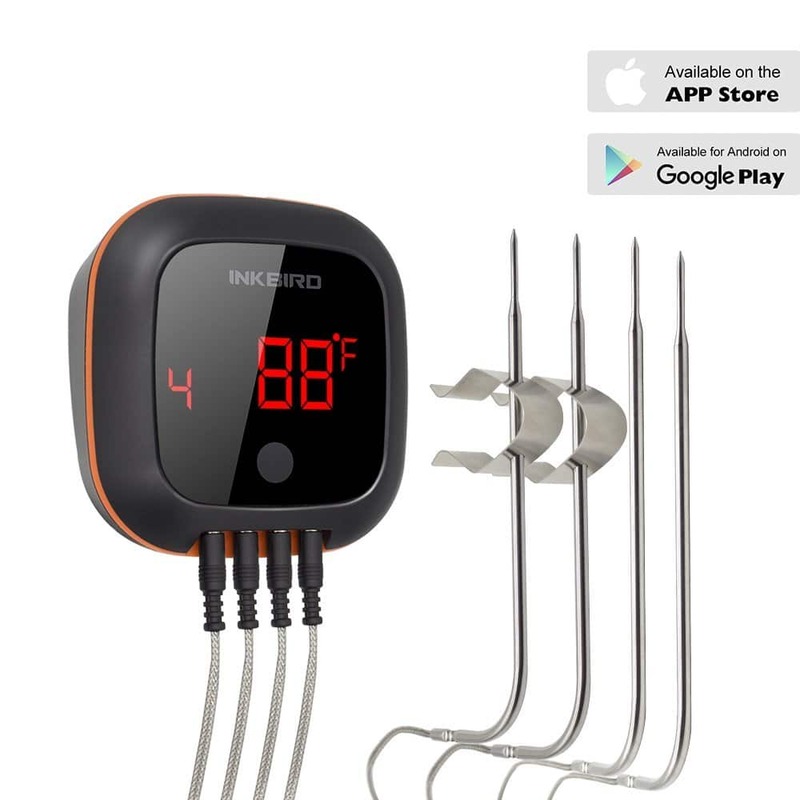 Who Is The INKBIRD IBT–4XS BBQ Bluetooth Thermometer For? This thermometer is great for the casual or serious griller both who is looking to make cooking and grilling easy and convenient. This is an excellent option to look at if you are in the market for a new wireless thermometer. The style, functionality, and features are well worth the money in my opinion. A good wireless thermometer allows you to monitor the temperature of your food in real time without being glued to your grill or smoker. This lets you avoid overcooking, and ruining an expensive cut of meat. If you are not tech savvy and don’t own a smart device, then there are better options out there for you. Although the IBT-4XS can be used as a stand-alone thermometer unit without connecting a Bluetooth device, your capabilities are severely diminished. A better option for you may be the Thermopro Wireless Meat Thermometer, which I reviewed here. Also, if you are fine with a unit that only supports two probes, the above-mentioned Thermopro fits the bill. Here is where I am going to share my personal experience with the IBT-4XS INKBIRD Bluetooth Thermometer. 1. Bluetooth Range – The Bluetooth range far exceeded my expectations. When comparing it side by side to my iGrill2 Bluetooth range, the IBT-4XS performed much better. I wandered my entire house and never once lost connection. It wasn’t until I went outside to the front of the house and almost to the street that I was alerted of a lost connection. Something that cannot be said of the iGrill2. 2. Large LCD Display – The LCD display was clear and bright and did not wash out in the sunlight. It performed great in both low light and bright light conditions. The rotating display function was an awesome addition too. 3. No Confusing Buttons – The device was so simple to set up and use and there are no confusing buttons to figure out. Take it out of the box and you can intuitively figure it out. 4. Accuracy – I tested the IBT-4XS against several other leave-in thermometers simultaneously including the Weber iGrill2 and it performed just as well or better than all of them. It also measured up well to the best of the best when I tested it against my Thermoworks MK4 instant read thermometer. 5. The Design – Don’t let the sleek and lightweight design fool you. This is a well-made and sturdy device. The fact that it looks awesome is a big plus too. 1. No Ambient Temperature Probe – The INKBIRD IBT-4XS ships with 4 meat probes. I would really like to see INKBIRD exchange one of the meat probes for a shorter, snub-nosed ambient probe. When using the meat probe with the included grate clips, the probe is a little long making it harder to position right. With a little experimenting, I was able to make it work well though. This is something I hope they consider in the future. 2. User’s Manual – I mentioned earlier that the users manual was simple and easy to follow but maybe a little too easy. What I meant by that is I wish they had included a little more information on the APP settings in the manual. Even though it is pretty simple to figure it out, there were a couple of times I had to search around for some of the advanced settings. It really didn’t take that long but it would be helpful if it was in the manual. 3. Cord Wrap System – This was one of my biggest pet peeves. The extra-long probe cables are a nice addition, but storing these long cables can be tricky. A cord wrapping system like many of the probe thermometers include on the market would go a long way in preserving the life of the probes and make it much more convenient in my opinion. Again, hopefully, INKBIRD takes notice. 4. 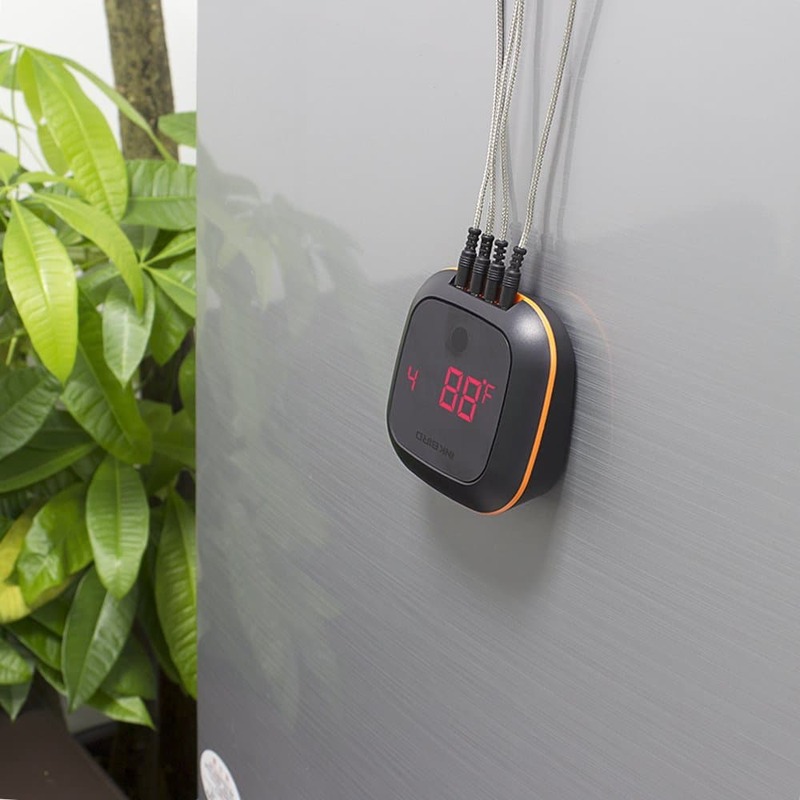 Temperature Cycling – A nice feature of this thermometer is that the LCD display cycles through each probes temperature automatically so you don’t have to physically push a button to see the temps. I personally would like to have a way to turn the cycling on or off depending on which probe temp I would like to see. This is minor but when I am doing a long cook and I know the food temp will take hours to get it to where I need it to be, I would like to focus only on the grill temp. Having to wait for the temperature to cycle through all three probes before I get to the one I want wasn’t ideal. Not a huge deal though. In my humble opinion, the pros far outweighed the cons on this device. The cons are mostly minor and do not affect the overall solid performance of this thermometer. While none of these issues would be deal breakers for me, I hope that INKBIRD will consider taking a look at them. You can get the All New IBT-4XS INKBIRD Bluetooth Thermometer for $59.99 on Amazon, which I think is a very good value for your money. With that, INKBIRD’s thermometer is backed by a 12-month warranty policy and responsive customer service. I am very happy that INKBIRD reached out to me to test their new thermometer. In fact, I have been using it exclusively for the past month and a half now. Not only to give it a thorough testing but because I’ve really liked the performance of it that much as well. It has performed better than the iGrill2 while coming in at about half the price all while adding additional extras and options. I am also happy to be able to share this product with you. The all-new IBT-4XS INKBIRD Bluetooth thermometer is a well built, easy to use wireless grilling thermometer. It is simple to use and has many helpful features, and for the price is a great thermometer. It would make an excellent addition to everybody’s grilling toolbox. 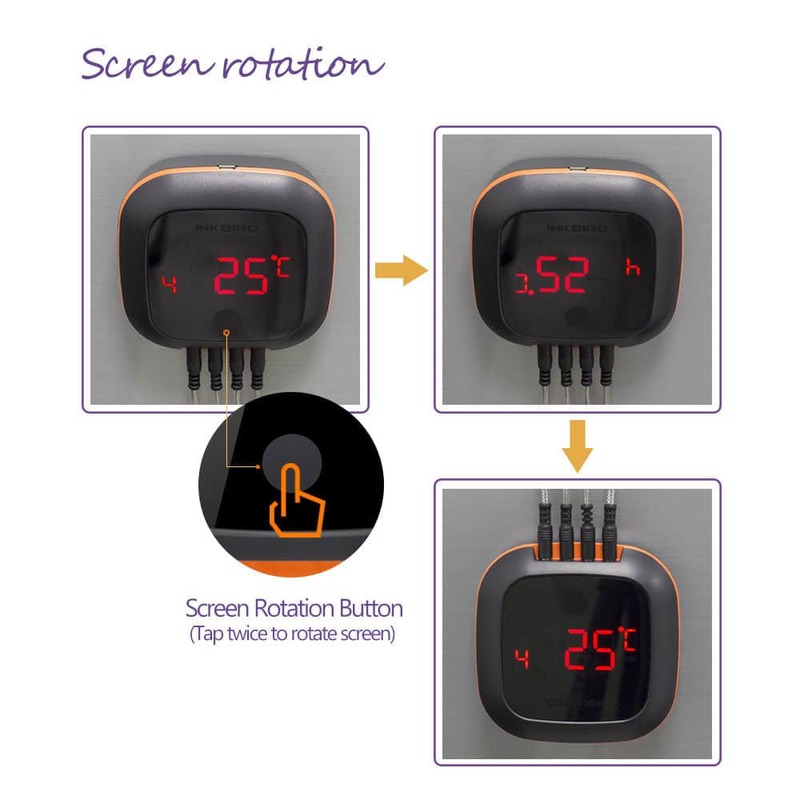 I hope this INKBIRD IBT–4XS BBQ Bluetooth Thermometer review was helpful for you. As always, if you or someone you know is interested in a remote leave-in probe thermometer, please consider sharing with your friends or on social media. Sharing is caring my friends! If you would like to leave a comment or have a review of your own to share on the INKBIRD IBT–4XS, please do so below. We always welcome your input. I like the Magnetic based and Rotatable reading design.thanks for sharing.